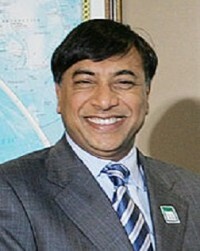 Lakshmi Narayan Mittal was born in 1950 in Rajasthan, India. to a poor and large family. He spent most of his childhood in the village until his family moved to Calcutta. There, his father, Mohan, became a partner in a steel company and eventually made fortune. In 1969, Mittal graduated from St. Xavier's College in Calcutta with a business and accounting degree. Mittal started his career with the family in the steel-making trade until 1976, when the Mittal family founded its own steel business. Mittal then developed the international division of the company, starting with the purchase of a bankrupt plant in Indonesia. In 1994, due to disagreements with his father and brothers, he took over all the international trade of the family's steel business and branched out on his own. In 2002, a British member of Parliament, Adam Price, made public a controversial link between Mittal and Prime Minister Tony Blair, an affair later referred as the Garbagegate or Cash for Influence. Through his Dutch Antilles-based company LNM, which gathers less than 1% of its workforce (estimated at more than 100,000) in the United Kingdom, Mittal sought Blair's European influence in its bid to take over control of Romania's state-owned steel industry. Price obtained a copy of the letter Blair addressed to the Romanian government, which insinuated that the privatization and sale of the firm to LNM might ease the process of Romania's entry into the European Union. In return, Mittal donated $245,000 to Blair's Labour Party after the 2001 general elections. Ever since 2005, Mittal has been reported as the wealthiest person in the U.K. And he is the 5th richest man in the world, according to Forbes magazine, worth more than $50 billion.